"This is a quick and healthy dish. Great in the summer when zucchini is in season! Sound too easy to be good? Try it!" 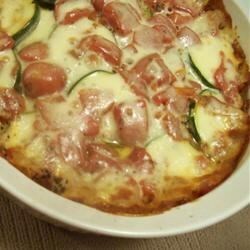 Slice zucchini and onion and place in a glass dish baking dish. Add can of tomatoes, salt and pepper. Sprinkle cheese over top. Place lid on dish. Bake in the preheated 350 degrees F (175 degrees C) until zucchini becomes tender, 20 minutes. I have been making this for years , but I do mine in the frying pan and I add ground beef and cumin and garlic for more flavor. Then I eat it with tortillas. This recipe is excellent to use all those extra tomato and zucchinis from the garden. I sprinkle italian herbs over top of the veggies before adding the cheese. Super easy, and was a hit for my family. I used canned, diced tomatoes that were seasoned with Italian herbs. I also sprinkled some extra herbs on tob, and added mushrooms. Great taste! I will never make it again.